Gerald Hodges is calling it a career. The veteran linebacker announced on Twitter that he’s decided to retire. Hodges had a standout collegiate career at Penn State, earning both first-team (2011) and second-team (2012) All-Big Ten honors. While he was expected to be selected in the second or third round of the 2013 draft, he ended up falling to the Vikings in the fourth round. After being drafted, the linebacker subsequently inked a four-year, $2.52MM deal. Hodges ended up playing two-plus seasons with the Vikings, including a 2014 campaign where he compiled 66 tackles in 14 games (seven starts). 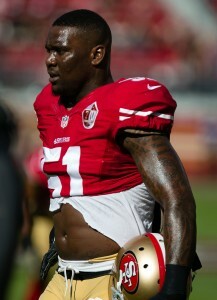 The linebacker was traded to the 49ers during the 2015 season, and his first full season with San Francisco proved to be a career year. Hodges finished the 2016 season with career-highs in tackles (83) and sacks (three) in 15 games (12 starts). He spent the 2017 campaign with the Saints before moving on to the Cardinals in 2018. The 28-year-old had a productive season with Arizona, finishing with 55 tackles. Despite putting up solid numbers last season, Hodges apparently wasn’t able to generate a whole lot of interest in free agency. The 28-year-old retires having earned more than $5MM throughout his career (via Spotrac). The Cardinals have signed free agent linebacker Gerald Hodges, according to Adam Schefter of ESPN.com (Twitter link). Arizona likely lost fellow linebacker Jeremy Cash for the year on Saturday night, as his knee injury is believed to be season-ending. Cash wasn’t viewed as a starter for the Cardinals, but was expected to play a key role as a reserve and special-teamer, so Hodges, who worked out for Arizona in late July, will likely take over in both capacities. Hodges, 27, could prove to be even more valuable than a generic backup, as he has plenty of experience (65 appearances, 25 starts) under his belt. A fourth-round pick in the 2013 draft, Hodges entered the NFL with the Vikings before being traded to the 49ers midway through the 2015 season. The 2016 campaign was one of Hodges’ finest — Pro Football Focus graded him as the league’s No. 21 linebacker — but he garnered scant interest on the open market. He landed with the Saints in October and played mostly special teams snaps down the stretch. Hodges is capable of playing all three linebacker positions, so he’ll add depth behind starters Haason Reddick, Deone Bucannon, and Josh Bynes. Bynes, for his part, is slated to start at middle linebacker, but he’s been primarily a special-teamer during his career and made just one start in 2017. Hodges, therefore, could conceivably earn more snaps in the middle if Bynes struggles early in the 2018 season. Linebacker Gerald Hodges will work out for the Cardinals on Tuesday, Ian Rapoport of NFL.com tweets. The Cardinals’ interest level is not immediately clear, but they are looking for veteran help. Hodges joined the Saints in 2017 following the team’s Week 5 bye week. He became a key cog on special teams, but he appeared in only 13 snaps on defense and eleven of those came in a blowout win over the Bills in Week 10. The Saints were the third team Hodges had played with since entering the league in 2013, following stints with Minnesota and San Francisco. In February, he was released by New Orleans. The veteran didn’t do a whole lot last year, but he has proven that he can be a capable contributor. In 2016, he racked up 83 tackles, three sacks, and two interceptions in 15 games with the 49ers. In that season, he graded out as the league’s No. 21 ranked linebacker, per the metrics at Pro Football Focus. The Saints made a pair of moves on Tuesday, releasing veteran linebacker Gerald Hodges to clear way for offensive lineman John Theus, who the team claimed following his release from the Panthers on Monday. Hodges joined the team in 2017 following its Week 5 bye week and became a key cog on special teams. He appeared in only 13 snaps on defense, however, 11 of those coming in a blowout victory over Buffalo in Week 10. The Saints were the third team Hodges had played with since entering the league in 2013, following stints with Minnesota and San Francisco. A fifth-round selection in 2016 out of Georgia, Theus appeared in four games and made one start with the 49ers as a rookie before joining the Panthers in 2017. He did not appear in a game with the Panthers before going on injured reserve in December. 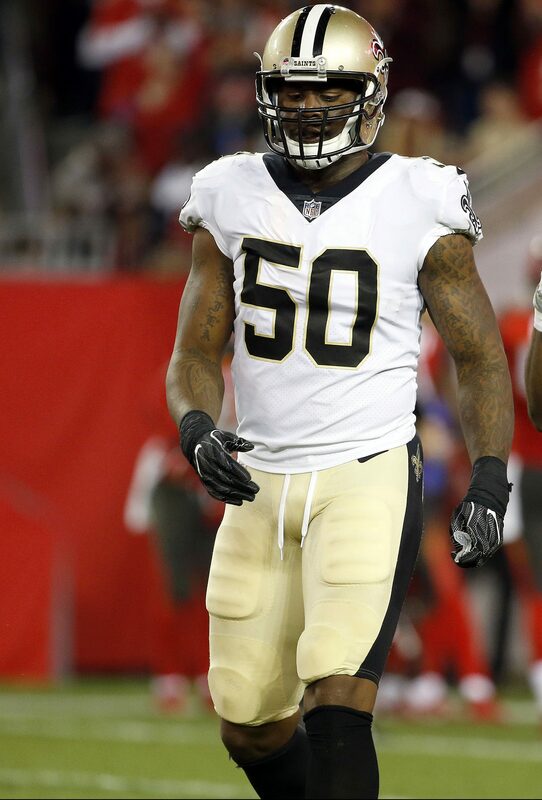 The Saints are signing linebacker Gerald Hodges, a source tells Adam Schefter of ESPN.com (on Twitter). Hodges worked out for the Saints earlier this month and he finally got the call he was waiting for today. After putting Alex Anzalone on injured reserve, the Saints were looking a little thin at linebacker. 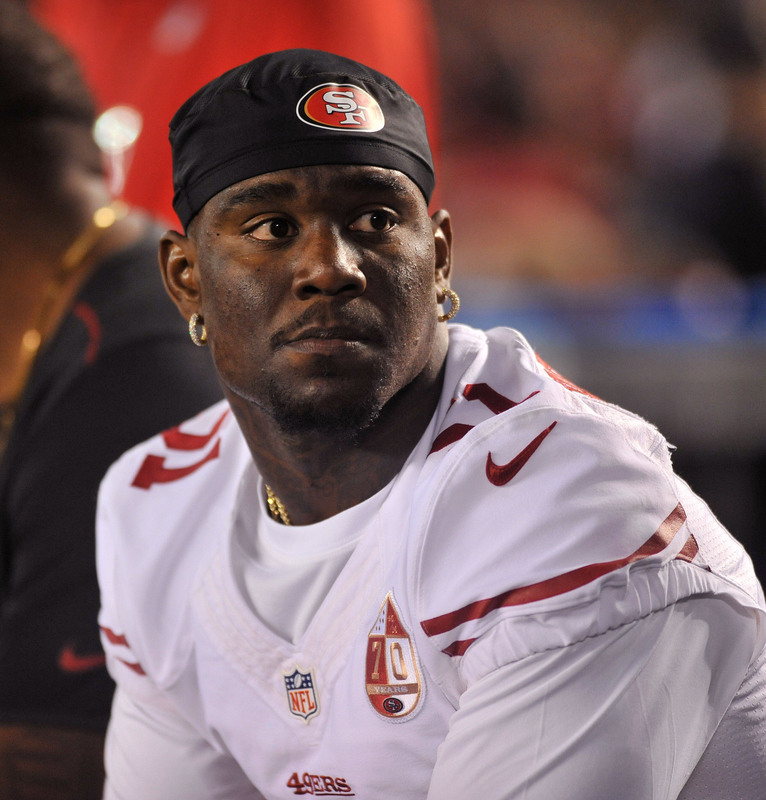 The addition of Hodges, who racked up 83 tackles, three sacks, and two interceptions in 15 games with the 49ers in 2016, should help in that regard. He also graded out as the league’s No. 21 linebacker, per the metrics at Pro Football Focus. Hodges was set to spend the season with the Bills but wound up as a surprise cut in early September. The 26-year-old had to watch the first five weeks of the season from his couch, but the good news is that he should receive a healthy amount of playing time in New Orleans. The Saints worked out linebacker Gerald Hodges, according to a source who spoke with Mike Florio of PFT (on Twitter). There’s no word yet on how the audition went or whether a deal is imminent. The Bills signed Hodges this offseason after losing Zach Brown and Lerentee McCray, so he appeared to be in line for a starting job or, at the very least, significant playing time. Instead, he was a surprise cut on Sept. 3. This appears to be Hodges’ first known audition since being let go by Buffalo. In his previous round of free agency, the Chiefs, Seahawks, Jets, Giants, Patriots, Jaguars, and Colts also showed interest in him. In 2016, Hodges played on roughly half of the 49ers’ defensive snaps last year while grading out as the league’s No. 21 linebacker, per the numbers at Pro Football Focus. In those 15 games, the 26-year-old tallied 80 tackles, three sacks, and two interceptions. He also was on the field for 73 special teams snaps. The Bills have released linebacker Gerald Hodges, according to Mike Florio of Pro Football Talk (on Twitter). Hodges was widely expected to make the Bills’ roster. Buffalo signed Hodges in May after meeting with the Chiefs, Seahawks, Jets, Giants, Patriots, Jaguars, and Colts in free agency. Hodges thought that the departures of of Zach Brown and Lerentee McCray would allow him to see significant playing time and perhaps even start at outside linebacker. Instead, he’s out of work heading into Week 1. He played on approximately half of the 49ers’ defensive snaps last year while grading out as the league’s No. 21 linebacker, according to Pro Football Focus. In his 15 games, the 26-year-old racked up 80 tackles, three sacks, and two interceptions. He also was on the field for 73 special teams snaps. Bills coach Sean McDermott announced that the team is has signed linebacker Gerald Hodges (Twitter link via Jay Skurski of The Buffalo News). To make room, the Bills cut cornerback Charles Gaines. Hodges only visited with two clubs — the Chiefs and Seahawks — during the first month of free agency. Recently, however, he has embarked on a tour that saw him meet with the Jets, Giants, Patriots, Jaguars, and Colts. However, it was his meeting with the Bills that has fostered a deal. 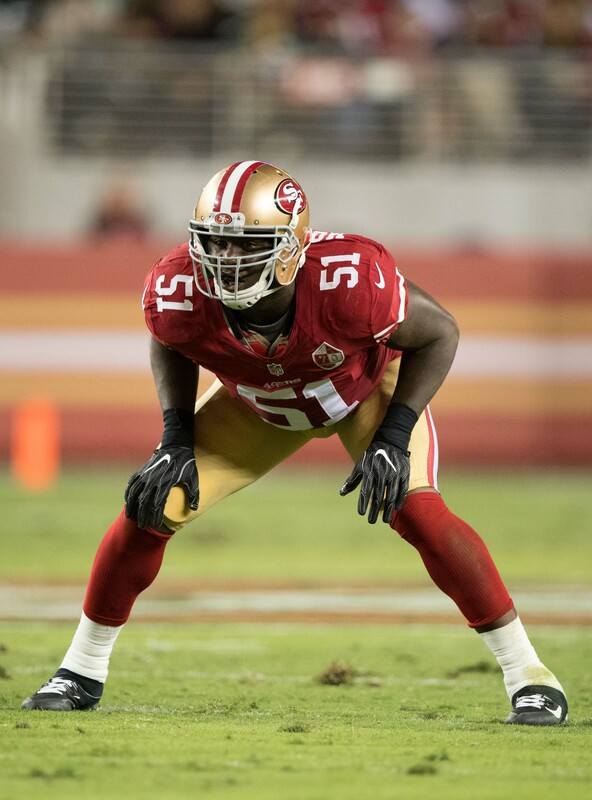 Hodges played on approximately half of the 49ers’ defensive snaps last year while grading out as the league’s No. 21 linebacker, according to Pro Football Focus. In his 15 games, the 26-year-old racked up 80 tackles, three sacks, and two interceptions. He also was on the field for 73 special teams snaps. The Bills’ linebacker group has already gone through some changes this year after the departures of Zach Brown and Lerentee McCray in free agency. The Bills project to start Reggie Ragland and Lorenzo Alexander at the OLB spots with Preston Brown in the middle, but the group behind them is looking a little thin. Ramon Humber and rookies Matt Milano and Tanner Vallejo figure to primarily pitch in as reserve OLBs, leaving them without a proven depth option for MLB. That’s where Hodges might come in handy for Buffalo.